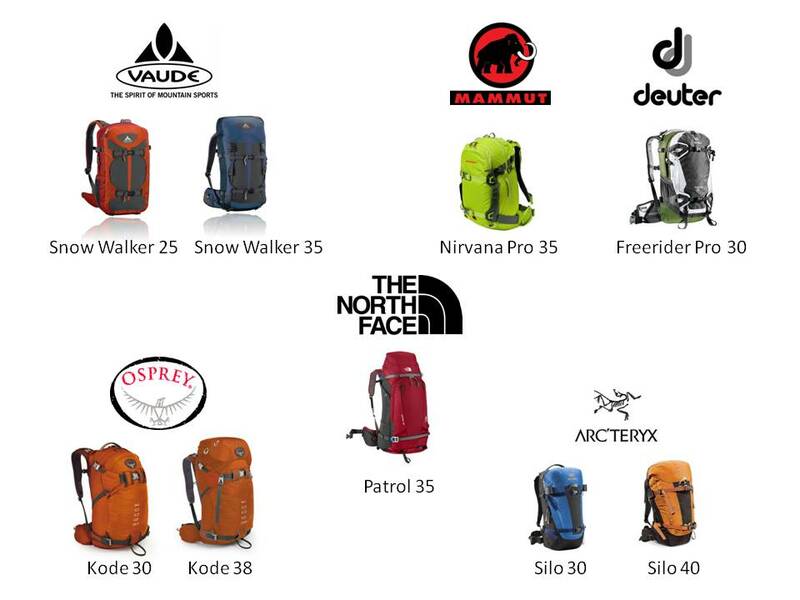 After having spent a few hours researching the availability of backpacks for snowshoeing, I thought I'd share what I've found so far. My idea of a backpack for snowshoeing starts with straps for attaching snowshoes to the pack (when conditions are such that you are better off walking with boots only) and gear hooks/straps for poles (when conditions don't require the use of them). In my case, I was looking for a pack in the 30 to 40 liter range. Preferably the pack have an abrasion resistant finish on the back to lessen the wear & tear from strapping snowshoes. Below is a diagram of the packs I've found so far (click to see full size), followed by some comments on each pack. Snow Walker 25 Made specifically for snowshoeing, this nicely detailed pack is a bit smaller than what I had it mind but it's still worthy of a mention. It includes adjustable straps (sizes Small to Extra Large) and adjustable back ventilation. The 25 liter model has two top-zip openings along with a 2 outer mesh pockets - something not found on the 35 liter model. These pockets can be useful for (insulated) water bottles for users who don't like hydration systems. It has relatively short padding along the hip belt, probably not much of a concern if the pack is going to be lightly loaded. Snow Walker 35 With similar features as the Snow Walker 25, this model is a top loader with a lid an significantly longer padding along the hip belt. If you plan on loading your pack, this would be a better choice over the 25 liter model. While the straps and back ventilation may be adjustable, the length of the pack is not. That means that this pack (and the 25 liter model also) won't fit everyone. Kode 30 With details and construction typical of Osprey packs, this is the only model in their product line designed specifically for snow applications. More of a snowboard and ski pack than anything else, the strap system is bit convoluted and more complicated than necessary for snowshoe applications. This pack opens wide from the back, facilitating access to the full contents. The buckles are smaller than most other brands and look fragile. Available in S-M-L sizes and Black & Alpenglow colors. Kode 38 Very similar to the Kode 30 with the addition of an expandable top helmet pocket. Since most snowshoers don't wear helmets, this extra space may/may not be useful. Available in S-M-L sizes and Black & Alpenglow colors. Nirvana Pro 35 Recently updated, this pack seemed to have everything I wanted. However many reviews commented on the length of this pack and how it was too short for people that were 6ft1in (187 cm). On that basis, I gave up hope of owning this pack. Opening in the back similar to the Osprey Kode, this pack seemed to have more robust straps and buckles, as well as tougher (but heavier) fabric. Available in one size only and oasis-smoke, deep sea-smoke and black-smoke colors. Freerider Pro 30 Similar to the Freerider Pro 28 SL (winner of Backpacker's gear review awards for Best for Snowshoers pack). A bit on the heavy side, this pack seems to have a sturdy strap system with possibly the best abrasion protection of all packs listed here. See Outside's blog for more comments on the Pro 30. Available in white-pine-black colors. Silo 30 With a price corresponding to the brand's reputation, this clean pack is "V" shaped, which may make it inappropriate for "A-Frame" carrying of skis. It seems to have a clean and easy to use strap design along with good abrasion protection. This panel loading model has waterproof zippers and two nice Velcro accessory straps. Available in Regular and Tall sizes and in black-black, black-copper and black-everglade colors. Silo 40 similar in appearance to the Silo 30, this is a roll-top model with lid. While this provides easier access/loading of large items in pack, the contents aren't as easy to access as on other packs with multiple compartments. Available in Short, Regular and Tall sizes and in black-black and black-copper colors. Patrol 35 A top-zip model with a large front pocket and bottom compartment for ski skins or crampons, this model has an "Inverted-V" shape which may reduce snow accumulation during heavy precipitation. Available in Medium and Large sizes and in black-asphalt grey and chili pepper red-asphalt grey colors. The opening for the pack is perhaps not as large as other pack but the volume inside the pack is rather impressive. It has two very easy to use straps that hold snowshoes (and skis/snowboards) securely to the back of the pack. It also has an easy-access side ski pole pocket, which can also be used for large or medium sized bottles. Not shown on the pictures is a elastic gear loop near the front top-left corner of the avy equipment pouch. Unable to find a local dealer for the Deuter and Arc'Teryx packs, I was able to try the Osprey Kode 30, the Vaude Snow Walker 25 and 35 and the North Face Patrol 35. Trying the Mammut Nirvana Pro 35 meant waiting for the SAIL store to open in Ottawa in November to December time-frame with a likely conclusion that it would be too short. The Vaude bags were interesting but unfortunately not long enough for my 6ft4in (195cm) frame despite the adjustable straps. The 25 liter model ended up being a good choice for my wife. The Osprey Kode was a high quality pack but the straps for the snowshoes and for stabilizing the pack were more hassle than anything else. Probably a decent design for skiing/snowboarding, not the best solution for my snowshoeing needs. In the end, it's the fit and comfort of a Large model of the North Face Patrol 35 on my rather longish frame and the very simple strap set-up that did it for me. P.S. If I've missed any backpacks that should have been given consideration, please leave me a comment with the details. This is great! Thank you for sharing this. Just came across your blog and this post. Any updates on how the bags are performing? Thanks! While I considered many different bags, I ended up buying only the North Face Patrol 35. It has served me well and I've found it to be comfortable for light to medium loads (I haven't had to load it to capacity yet). The straps behind the pack are really convenient for tying snowshoes when not required (the main reason I chose this bag). Last weekend I had no issues strapping two pairs of snowshoes to the pack at the same time (one pair in the back, the other on each side of the pack using the compression straps). The bag has been modified this year (Patrol 34) and looking at picture of the strap system, I'm not sure it would be as convenient for carrying snowshoes (looks like it's geared more to skis).